Scaly, itchy skin isn't fun. But although psoriasis as an autoimmune condition isn't easy to fully treat, you can take steps to ease the itching and the flaking. I've tested five products that might just do the trick. This post contains some affiliate links. This means that if you decide to click on the links and make a purchase, I may receive a small commission, at no extra cost to you, that helps me keep the blog running. Thank you for your support. Ever since I decided to totally forget about my psoriasis it's been going fairly well. I've freed up so much time I spent Googling and trying to find answers. I'm sure my skin has even improved, my stress levels and late night phone-scrolling being much less. But it doesn't take away the fact that I'll still brush my fingers against that patch on my scalp and produce a whirlwind of tiny, fine white flakes that float to my shoulders. So I still take action to try and control the flaking. 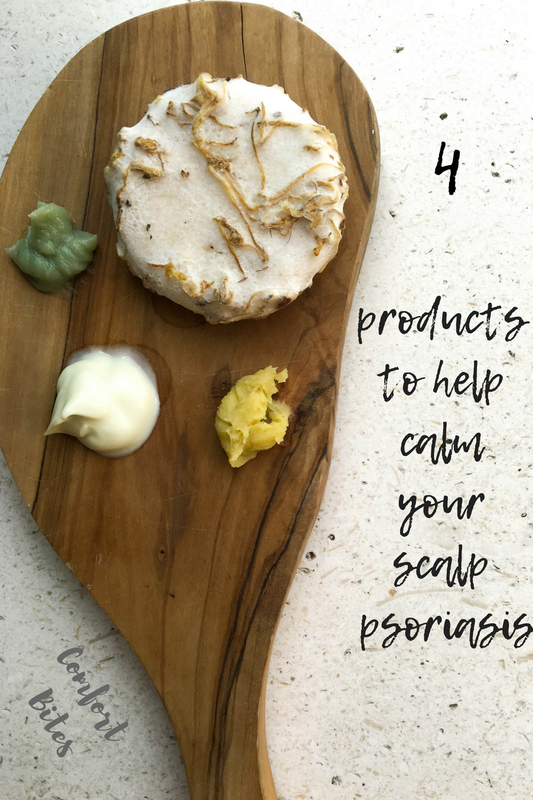 I've tried coal tar shampoos and dandruff shampoos (one thing my 25 years with the condition has taught me is not to bother, psoriasis is not the same thing as plain, regular dandruff). I was even sent a sample of a shampoo that had rave reviews for psoriasis on Amazon but it didn't work for me. I've massaged in tea tree oil after a shower, which seemed to work for a while but then didn't make any difference. Same for vitamin E oil. I squirted a mixture of glycerin and witch hazel onto the patch and slept with it overnight, which again seemed to moisturise it for a while, but then stopped really working. I don't think there is a lotion or shampoo formulated for psoriasis which I, in my desperation, haven't tried. But I have found a few that really did seem to work. If you're suffering with psoriasis, maybe give them a try. This is a soap bar (bonus points for not containing any plastic - hurray!) that you dampen with water in your shower or bath and then rub between your palms, producing fluffy bubbles. You then rub this into your scalp. I do it first when I'm in the shower, then leave the shampoo on my scalp while I wash the rest of my body. Then I rinse it off before getting out. The lady in the Lush shop mentioned to me that it contains a lot of ingredients that can calm the scalp and I've honestly seen it work. The only downside? The bits of straw-like stuff you have to pick out of the shower plug. But it seems to work for the scalp. At around £20 for 120ml this stuff isn't cheap. But it works. At least for me. It comes in a little glass jar with a lid, and it's a pale, creamy yellow ointment that's hard to the touch, kind of like coconut butter. It contains hemp, which is credited with helping to calm inflammation and is recommended as a moisturiser for psoriasis and also eczema. I scoop up a finger tip's worth and, parting my hair, massage it into my psoriasis patch. It doesn't disappear straight away into an oily mess - it kind of just sits there on the skin for a while, which I think really helps it get to work. Then I sleep with it in overnight on a towel-lined pillow and then shower the next morning (with the Soak and Float, above). Some of the reviews online complain about the smell, but I quite like it. It smells kind of herbal and sweet. I think we're conditioned to think that moisturisers have to smell like honey or roses or whatever. If it does the job, I don't mind what it smells like. And, to be honest, it feels so good on my psoriasis patch that I often end up rubbing a little onto my fingertips and massaging into my whole scalp. Another one from Lush, but I've really found their products helpful. It has a looser consistency than the Pure Potions, and it's cheaper. It's a pale green colour, and solid, although on a warm day it has the consistency of cream, to me. It melts more readily than the Pure Potions one, and smells a bit like lavender and tea tree. Although this worked and did moisturise my psoriasis patch, I did find it much greasier in texture than the Pure Potions and sometimes a bit tricky to wash out if I applied too much. But it's here because it is a good moisturiser and it did work well. A small tin should also last you a few months, so it's great value. Not as intensively moisturising as the Superbalm or Pure Potions, but if you're having a really bad flare-up day, I've found this helps cool the scalp straight away and puts the brakes on the itching. I use it if my skin is particularly bad. It contains oat milk, lavender and chamomile and it comes as a soft cream that soaks into the skin straight away. It smells lovely but if you're rubbing into your scalp it'll make your hair look wet for hours and you'll need to wash it out before you go anywhere. Psoriasis can be tricky to heal completely, because it's a condition of the immune system rather than purely the skin, but you can take steps to cool and calm the itching. I hope this helps. Found a lotion or cream that works for your scalp psoriasis? Let me know what's worked for you in the comments below!